Objectivity in Chess by GM Igor Smirnov. Hi everybody! I am Igor Smirnov, International Grandmaster and a chess coach. This is the lesson “Objectivity”. In this issue I would like to discuss an important aspect of chess, which can determine one's success or failure in a game. I strongly believe that this will have a great impact on your chess development. Let me explain. Chess players often wonder “why can't I make any progress?” Let’s think about this question. It has great practical value. First, progress inherently is change. So it follows: if you are getting better, it means that you are changing. So if you want to make progress, you should be ready to make changes in yourself and the way you think about the game. Am I ready to change my opening repertoire? Am I ready to change my playing style? What about my thinking habits? Of course you should change your weaknesses. You will work on them and it will bring you the progress you desire. Here is the answer: you should admit your mistakes. Everyone understands this in general. However, we don’t do it really, because it hurts. Though it can be unpleasant, it is the only way to make real progress. Now it is time for you to ask yourself “Am I really objective?" I know that you will all answer “YES!” This is the first indicator of partiality! White: Kg1, Qf6, Re1, Be3, Ng3, Nf3, pawns: b2, d5, f2, g2, h6. 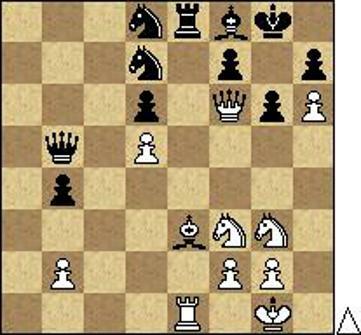 Black: Kg8, Qb5, Re8, Bf8, Nd8, Nd7, pawns: b4, d6, f7, g6, h7. It is white’s turn. Your task is to find the best move in the position. I am ready to give you 5 attempts. You may think about the position as long as you need. Please, select 5 candidate-moves, which are good in your opinion. Certainly you may not use computer assistance. Test yourself! 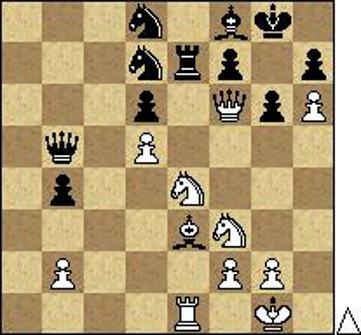 Let me give you some examples of personal bias in chess. Please, read carefully; just to ensure that these statements don't describe you! I know a lot of titled players, who take part in tournaments not only to get prizes and to make chess progress, they also go to have a good time! And they do! These players then show up the next morning for chess...and their condition is… well, not so good! They barely slept and woke up with a throbbing hangover. Of course this is not the best example of a sport discipline. However, they still find a way to win! What am I trying to illustrate with this example? I want you to admit one simple thing: your chess results depend on your chess skills. That is just it. All other arguments are mainly lame excuses! 2) Here is another example of bias: a chess player starts thinking that he understands chess at a much higher level than he actually does. * I play at an expert level in chess. * I am an advanced player. * I play on the master/fm/gm level. * I play well and now I only need to improve some openings to reach fm/im/gm level. * I know all the basic chess ideas already. When I ask such person about his rating, he usually answers: “It is not so high now, but…” I stop reading right after the word “but”. Your rating is the most objective indicator of your skill. All other evaluations of your skills are just your dreams. Please, hear me out, it is not my intention to offend you. I want to help you to be more objective and stimulate your chess development! Here is the solution to the task, which I gave you in the previous issue. White played 1.Ne4!! I am glad if you were able to find it. If black takes the knight 1…Rxe4, then 2.Qxd8 with a huge advantage. and here is the next task for you: find white’s next move. I'll give you 5 attempts. You may think about the position for as long as you need. Please, select 5 candidate-moves, which are good for white in your opinion. You may not use computer assistance. You need to be able to do something that your opponents can’t. You need to know something your opponents don’t know. Please, think about it. Take a piece of paper and write down your “extra skills” (number 1 is …, number 2 is … and so on). The length of your list will show you clearly your chances for winning against strong opponents. If you want to get the most effective extra-skills and to beat stronger opponents, I recommend you the video course "How to Beat Titled Players". When you start applying its recommendations, you will play many beautiful games; you will enjoy your creativity and of course will start beating strong players!